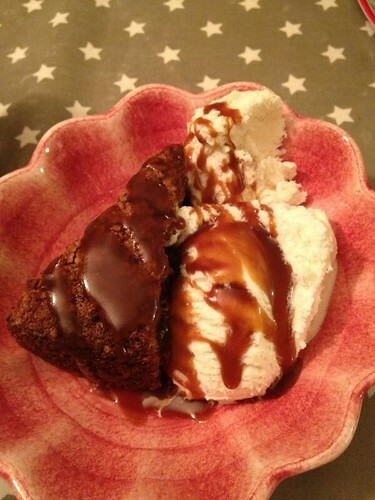 Serve it straight up, or for a fancier take on it, make some butterscotch sauce, and serve it over vanilla ice cream. Delicious. Mix the dry ingredients together - flour, whole wheat four, cinnamon, salt, ginger, cardamom and baking soda. Stir together the wet ingredients: eggs, sugar, oil, and then the bananas and buttermilk. Stir in the dry ingredients, and fold until combined. Pour into a prepared pan (I just butter a springform pan most of the time) and bake at 170°C for about an hour. Check with a cake tester to make sure it's cooked through, and be prepared to cover it with foil if it looks in any danger of burning. This looks really good....I like the idea of adding the spices....will defiantly be trying your recipe!